In 1977 Iran was booming; its growth rate was only limited by the capacity of its ports to handle imports. Some thought that by the turn of the century it would have the fourth largest national economy. The London Chamber of Commerce decided to send a ten day trade mission to Tehran and Fulmer decided to send me with them. My main task was to sell the Fulmer Materials Optimizer (FMO) and to find opportunities for contract work. There were about twenty of us on the mission, staying at the Commodore Hotel in central Tehran. No-one seemed to have been able to make any local contacts in advance but most of us had a list of possible prospects. The hotel had one publicly accessible telephone line and one telephone directory, so sharp elbows were required to arrange appointments for visits. We were given some help at the British Embassy and a pleasant reception at the Ambassador’s Residence. In the event I found that local business men found contract R & D a mystifying and irrelevant concept; at Tehran University and at Tehran Technical University there was considerable interest in the FMO but neither organization actually bought one. Our stay included one weekend and, having an interest in Islamic architecture, I decided to make a trip to Isfahan, about 300 miles south. Five hours by road each way did not appeal so I decide to book a flight, even though it arrived about midnight and pressure on telephone time prevented me from booking a hotel. On arrival at Isfahan I joined a scrum of local people seeking a taxi. Eventually, I managed to get into one, along with a number of other passengers. The driver and I had no language in common but he nodded when I said ‘hotel’ so I was cautiously optimistic. The taxi journey lasted somewhat less than an hour during which I became a bit anxious. We did not pass any hotels and we soon entered a residential area in which a maze of streets were bordered by high walls, with double high gates to each house. Periodically the driver would drop one of the other passengers and appear to have a flaming row with him about the fare. At each of these stops I would repeat ‘hotel!’ and the driver would nod assent. Eventually, I was the only passenger left; we drove on and finally arrived at the taxi driver’s house. Clearly I was to stay the night there. I winced a little at the price he asked but I failed to think of a better option. He motioned me to stay where I was and let himself into his courtyard. After what seemed a long while he returned, drove into the yard and invited me into the house. There was a bed in the first room and this was to be mine. He showed me where the bathroom was and I counted sixteen toothbrushes there. Clearly there were women and children in the house but I didn’t see any of them. My bed was warm; I was evidently not the first to occupy it that night. Early in the morning my host brought me breakfast: some strange looking nodules that turned out to be cheese, some rough bread and strong tea – very welcome at the time. I had a guidebook with me so I was able to ask directions to the Royal Square. This turned out to be less than a mile to the south so I went on foot, seeing the Friday Mosque on the way and approaching the square through the Grand Bazaar. Thus I entered one of the most beautiful squares in the world, arguably the most beautiful. I had a wonderful day seeing most of the principle monuments in the city. I even put my head round the door of the Shah Abbas Hotel – constructed from the seventeenth century caravanserai of the royal madrasa and wonderfully decorated with mosaic and mirror work. If the taxi driver had taken me there the night before I would not have been able to afford the room – luckily I have stayed there since with my wife Gill. I returned to Tehran by the evening flight with no further incident. At breakfast the next morning I learned that three others of the party had also arranged a day trip to Isfahan. They had shared a taxi with a driver who had a competitive approach and a fatalistic attitude to blind overtaking. By the end of their return journey, they were all screaming at him and one had wet himself! Mine was the wiser choice. 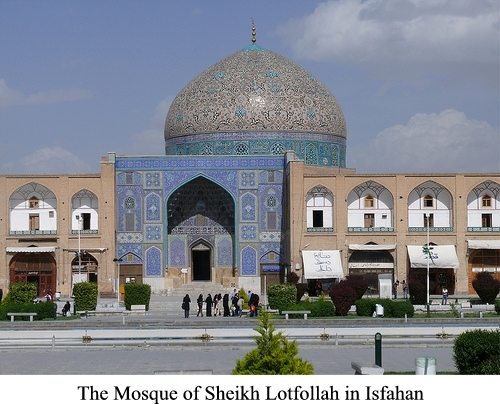 By 1979, less than two years later Iran had been transformed; the Shah had fled and Ayatollah Khomeni had returned from exile and imposed harsh theocratic rule through his Islamic Revolutionary Guards. A footnote to this tale is that I once heard Eric Duckworth telling it to a visitor; he had embroidered it somewhat – he had me sleeping with the taxi driver!